Heat pumps are devices that utilise heat from low potential sources such as ground, water or air for heating or cooling purposes. Heat Pumps are considered to be an integral part of the refrigeration system. Heat pumps finds their share of consumption from two channels. First via installation of new heat pumps in refrigeration and second via replacement of the existing heat pump units. Heat pumps find profound use in all types of refrigeration systems, be it domestic, commercial or industrial in form of respective configurations. While these devices run on cooling cycles, heat pumps can operate on fully reversible cooling cycles as well. Heat pumps are generally gas- and electric-driven types of which the latter type has gained traction over the globe. The heat pumps market has been understood as a high value–high growth market growing at a continued pace at an upward trend over the forecast period. An array of operating parameters are considered prior to procurement and installation of heat pumps which include initial cost of installation, operating cost per annum (energy expenditure incurred), maintenance and servicing cost per annum (which increases per year), tax credit and subsidies earned and efficiency rate. These aforementioned parameters are critical for the end users to select the desired heat pumps fulfilling their requirements. Also, technical education and training has been provided by heat pump manufacturers to the product distributors and suppliers as well as end users helping in awareness of use of heat pumps. From the product life cycle of the identified types of heat pumps, air-to-air based heat pumps has been foremost introduced in the market which is now the most adopted air source heat pumps. The segment is considered to be in the advanced stages of growth. The air-to-water based heat pumps is considered to be in a relatively early stage of growth, whereas the ground source heat pump is in the later growth stage of the product life cycle however at a lower level of growth than air-to-air based heat pumps. The global heat pumps market has rode on the growth of the refrigeration systems and equipment market in the last decade, which is expected to witness robust growth over the forecast period. The rising urbanisation across developing regions of the globe has also been responsible for the use of heat pumps in required refrigeration equipment and systems in commercial and residential applications. The growth of the heat pumps market can also be attributed to specific product life cycle and subsequent replacement rate. Since its inception, the global heat pumps market has undergone chronological developments with respect to its design and configuration to evolve into high-efficiency operating units. Global demand for heat pumps is directly proportional to infrastructure development activities. Governments of developing countries such as India and China are focusing on urbanization, which in turn is anticipated to fuel demand for heat pumps. Another reason for growing demand for heat pumps is due to eco-friendly devices worldwide which is directly proportional to the global heat pumps demand, as heat pumps are very useful in reducing CO2 emission. It uses only ¼ electrical energy and ¾ environmental energy. The prominent regions aiding the growth of the global heat pumps market are Asia Pacific excluding Japan and Europe owing to significant degree of installed base and the potential demand by end-use sectors in the region. North and Latin America, Japan, and the Middle East and Africa are expected to witness moderate growth of heat pumps in their respective regions during the forecast period owing to limited demand as well as near fulfilment of present requirements. On the basis of product type, the air-to-water heat pumps has been considered as the dominant segment in terms of heat pumps market value share and growth. However, the growth of the hybrid heat pumps segment is expected to outpace its growth over the forecast period where the segment is currently in its initial stage of growth. In terms of refrigerant type, the heat pumps market is expected to be driven mainly by the HFC segment. However, due to regulations for the use of HFC-based refrigerants in the recent times, the use of CO2-based refrigerant is expected to increase at a rapid pace during the forecast period. By power source, the electric-driven heat pumps is poised to emerge as the dominant segment over the forecast period. On the basis of end use, the residential segment is estimated to register significant growth in utilization of heat pumps over its counterparts during the forecast period. This is due to the fact of a higher volume of refrigeration units sold in the residential segment thus imbibing a proficient share of heat pumps. Overall, the global heat pumps market is expected to grow at a CAGR of 7.1% in terms of value by the end of the forecast period. The varied climatic conditions around the globe also play an important in consumption of respective types of heat pumps. For e.g. The overall climatic condition in Western and Eastern Europe makes it best suited for air source heat pumps, while geothermal and hybrid type are better suited for Nordic region. Apart from North America, Western Europe and Japan, the global heat pumps market is rapidly growing in APEJ in countries such as China (the largest market for heating and cooling systems in the region), India, Indonesia, Malaysia and the Philippines. Demand for eco-friendly heating and cooling systems in these countries is expected to increase at a significant rate in the near future, further driving growth of the market for heat pumps. In India, South Korea, Brazil, South Africa and ASEAN countries, heat pumps are currently mostly used in industrial or commercial sectors and to a small extent in residential sector, therefore market penetration for heat pumps in these countries is low. This provides opportunities for heat pumps suppliers to optimise their profit margins. Examples of some of the participants involved in the production and sale of heat pumps include Viessmann Group, Glen Dimplex Group, Mitsubishi Electric Corporation, NIBE Group, Panasonic Corporation, Stiebel Eltron Group, The Bosch Group, United Technologies Corporation and Daikin Industries Limited. The chief strategies followed by the market participants in the development of global heat pumps market has been aggressive marketing and product (heat pumps) awareness programs for the end users, refrigeration OEMs and distributors as well as strategic collaborations with other enterprises to expand the business operations and sales footprint. For e.g. leading heat pumps manufacturer Viesmann Group in 2016, collaborated with Jaske & Wolf Verfahrenstechnik GmbH, a leading manufacturer and supplier of heat and waste water solution to provide heat recovery product to enhance its product offering of heat pumps and expand its geographical footprint in Europe. In 2016, the company also collaborated with KKE GmbH—a specialist in refrigeration, air conditioning, and power engineering—to cater to increasing demand for HVAC system for the food and retail industry hence augmenting the sales prospect of heat pumps. In 2016, Danfoss Group acquired Sondex Holdings A/S and DAF Energy to strengthen its position in the heating and cooling market with respect to sales of heat pumps. This FMI study offers a ten-year analysis and forecast of the global heat pumps market between 2016 and 2026. The study considers 2015 as the base year with market values estimated for the year 2016 and a forecast developed for the duration of 2017 to 2026. Compound Average Growth Rate (CAGR) is represented from 2016 to 2026. The study covers various perspectives of the market, including market dynamics, value chain, pricing analysis, competition analysis, regional and segmental growth comparison and macro-economic and industry growth analysis, along with segment level projections in a comprehensive manner. As per the findings of the study and perspectives of industry participants, the global heat pumps market is projected to grow at a CAGR of 7% between 2016 and 2026 in terms of value. Growing environmental concerns, supportive policy frameworks and reasonable costs of operations are some of the factors positively impacting the uptake of the heat pumps in the global market. The Future Market Insights report on heat pumps carefully analyses the market at a global and regional level through market segmentation on the basis of key parameters such as product type, power source, end users and the type of refrigerant used. The primary objective of the report is to offer key insights on market updates, competition positioning, current trends, market potential, growth rates and other relevant information and statistics in a suitable manner to the readers or various stakeholders of the market. Heat pumps are devices that utilise heat from low potential sources such as ground, water or air for heating or cooling purposes. Refrigerators and air conditioners are among the common examples of heat pumps. While these devices run on cooling cycles, heat pumps can operate on fully reversible cooling cycles as well. The report begins with a market introduction, defining the market taxonomy and product definitions regarding the global heat pump market assessment. In the next section, the report describes the market development background, covering macro-economic factors, industry factors, product life stage and associated stages, forecast factors, regional weighted average pricing analysis, value chain overview covering approximate margins, an indicative list of stakeholders involved in each stage and an assessment of the installed base and replacement rate of heat pumps for the base year considered for the study. The next section of the report discusses market dynamics such as drivers (supply and demand side), restraints and trends impacting the market growth at a global level. Market opportunities or potential for manufacturers have been presented in the subsequent section of the same chapter. This section also includes the impact assessment of market dynamics on the global heat pumps market at a qualitative level based on analysis facts and insights. Subsequent sections of the report provide value (US$ Mn) and volume (New Sales in ‘000 Units) projections for the heat pumps market on the basis of the aforementioned segments at a global level. The global market values represented in these section have been agglomerated by collecting data and information at a regional level. The market information, along with key facts and insights, covers unique analysis frameworks such as absolute $ opportunity analysis, year-on-year growth trend comparison, market share and attractiveness analysis for each of the sub-types covered in each segment. The next section of the report presents a summarised view of the global heat pumps market based on seven prominent regions considered in the study. The section includes the regional market position, growth potential, trends and market attractiveness analysis for each of these regions. All the above sections evaluate the present market scenario and growth prospects in the global heat pumps market, while the forecast presented in the sections assesses the market size in terms of volume and value. In order to offer an accurate forecast, we started by sizing the current market, which forms the basis of how the global heat pumps market is expected to develop in the future. Given the characteristics of the market, we triangulated the outcome of three different types of analysis, based on primary research, secondary research and our own analysis. However, forecasting the market in terms of various heat pump segments and regions is more a matter of quantifying expectations and identifying opportunities rather than rationalising them after the completion of the forecast exercise. In addition, it is imperative to note that, in an ever-fluctuating global economy, we not only conduct forecasts in terms of CAGR, but also analyse the market on the basis of key parameters such as Year-on-Year (Y-o-Y) growth to understand the predictability of the heat pumps market and identify the right opportunities available. As previously highlighted, the heat pumps market is split into a number of sub-segments. All the heat pump sub-segments, in terms of product type and region, have been analysed on the basis of Basis Point Share (BPS) to understand each individual segment’s relative contribution to the market growth. This detailed level of information is important for the identification of various key trends witnessed in the heat pumps market. 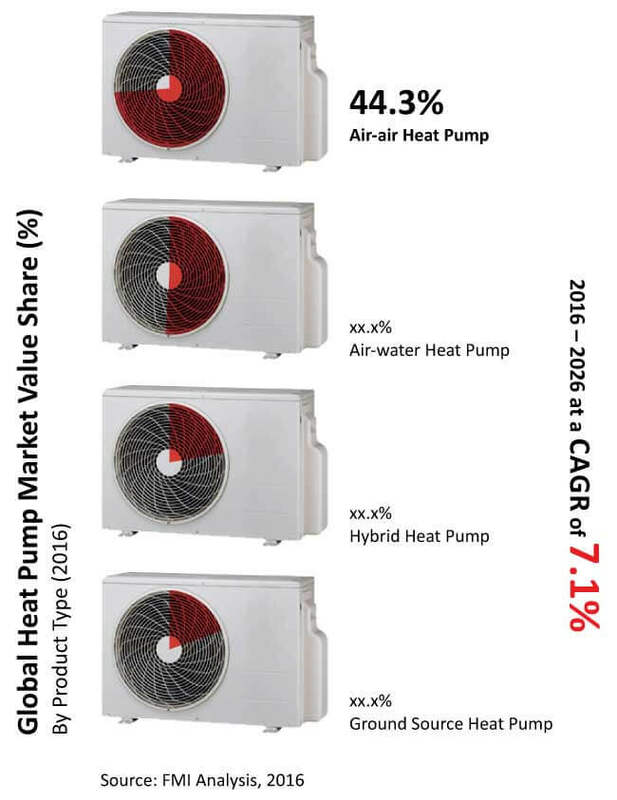 Another key feature of this report is the analysis of all the key segments in the heat pumps market, sub-segments and the regional adoption and revenue forecast in terms of absolute dollar opportunity. This is traditionally overlooked while forecasting the market; however, the absolute dollar opportunity is critical in assessing the level of opportunity that a provider can look to achieve, as well as to identify potential resources from a sales and delivery perspective in the heat pumps market. In order to understand the key market segments in terms of the growth and installation of heat pumps across concerned regions, Future Market Insights has developed the attractiveness index, which will help providers to identify real market opportunities. In the final section of the report, a competitive landscape of the heat pumps market is included to provide report audiences with a dashboard view categorised on the basis of providers present in the value chain, their presence in the heat pumps market and key differentiating factors and strategies. The primary category of providers covered in the report includes heat pump manufacturers. This section is primarily designed to provide clients with an objective and detailed comparative assessment of the key providers specific to a market segment in the value chain of the heat pumps market. Report audiences can gain segment-specific vendor insights to identify and evaluate key competitors on the basis of the in-depth assessment of their capabilities and success in the heat pumps marketplace. Detailed profiles of the providers are also included in the scope of the report to evaluate their long- and short-term strategies, key offerings and recent developments in the heat pumps market. Examples of some of the key competitors covered in the report include Daikin Industries Limited, Danfoss Group Global, Glen Dimplex Group, Mitsubishi Electric Corporation, NIBE Group, Panasonic Corporation, Stiebel Eltron Group, The Bosch Group, United Technologies Corporation and Viessmann Group.